The City of Apache Junction Parks and Recreation Department would like to invite the community to participate in our annual Easter Egg Hunt on Saturday, April 20th, 2019 at Prospector Park! Come help find over 8,500 prize filled eggs! This egg hunt is open to all ages and is free to the public. The hunt is divided up into separate age groups: 2 & under, 3&4, 5&6, 7&8, 9&10, 11-15 and 16 & over. Special prizes will be given to those who find a token in the egg during the hunt. Don't forget to bring your Easter baskets to carry all of your goodies! There will be other activities and games sponsored by local non-profit organizations available during and after the egg hunt. Most activities will cost a small fee to participate. Bring your camera so that you can capture your very own picture with the Easter Bunny! The first egg hunt will begin at 9 a.m. for kids 2 and under. The remaining hunts will begin immediately after the first in order of age. Be sure to come early and allow for plenty of time to park! For a donation of $4/adult and $2/child, you can enjoy a delicious pancake breakfast sponsored by Horizon Health & Wellness. The breakfast will begin at 7:30 a.m. and continue until the food runs out, so come early and come hungry! 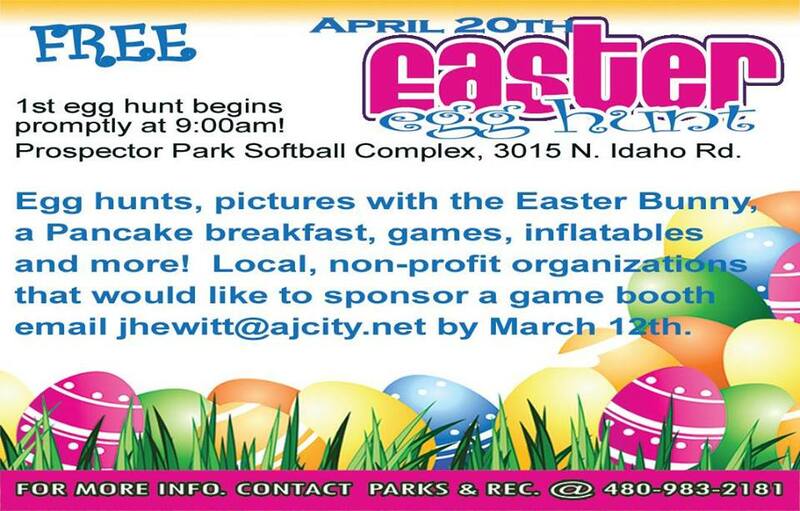 The hunt and breakfast will take place on the softball fields at Prospector Park, located at 3015 N. Idaho Rd. The park is about 1/8th of a mile north of Lost Dutchman Blvd. Any local non-profit organizations that would like to sponsor a booth at the Easter Egg Hunt should contact Justin Hewitt at 480-474-5146. Registration is not required.